My department was having a Christmas celebration – and each of us were given an extra job scope – which was to be a Secret Santa, and to buy a secret present for the person we’re suppose to secretly give to. I went to hunt for a Christmas present. Looked left, looked right and looked everywhere – but I couldn’t fine a suitable one. A suitable one for a guy, to be exact. So my problem is… I’m giving it to a dude, and I can’t help to wonder… why are the Christmas gifts mostly targeted for girls? 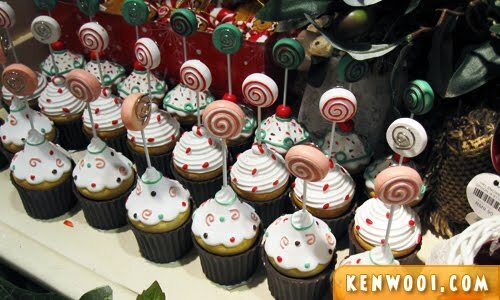 This cupcake-like souvenir with candy poking out from it. Some Lovely Lace Christmas Special gift box – with pink ribbons. 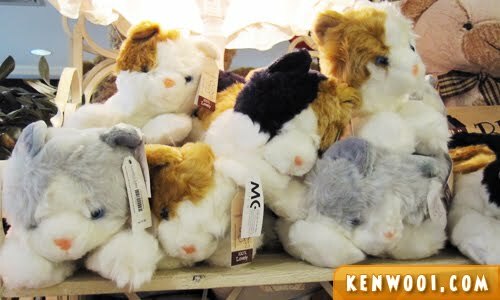 Fluffy soft toys. Cute furry ones. 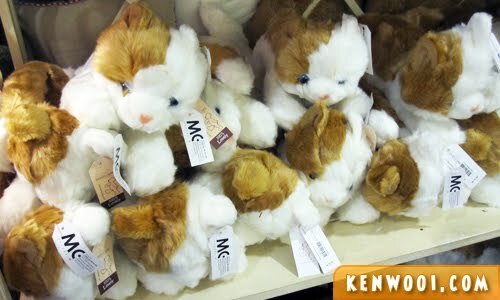 More fluffy soft toys. Adorable eyes with innocent look. 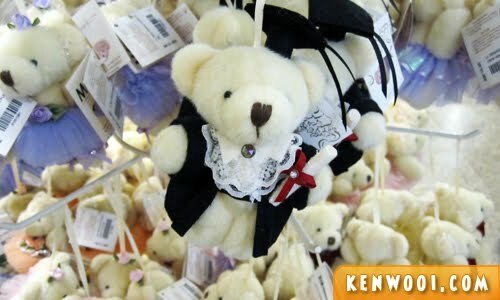 More and more fluffy soft toys – the graduation bear. What is he suppose to do with it? Play bear bear? 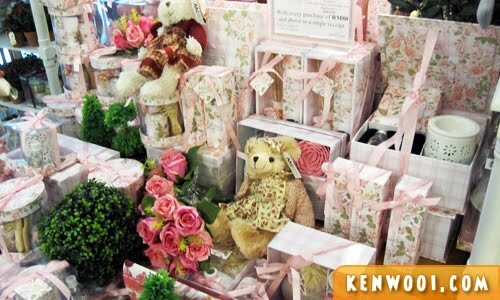 Pink gift set with teddy bears, cups and scented candles. You think I wanna seduce him is it ah? 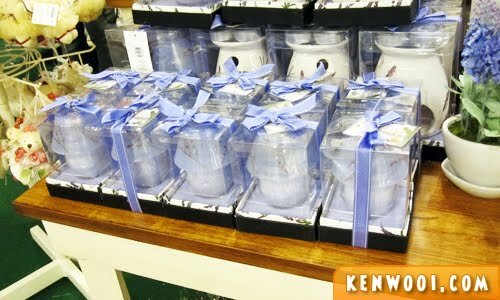 Some lamp decoration perfectly packaged with lavender fragrance. No – it’s so Twilight. 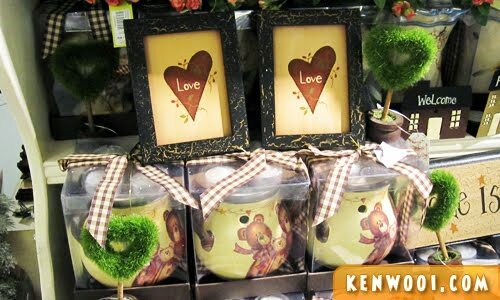 Photo frames and mugs. 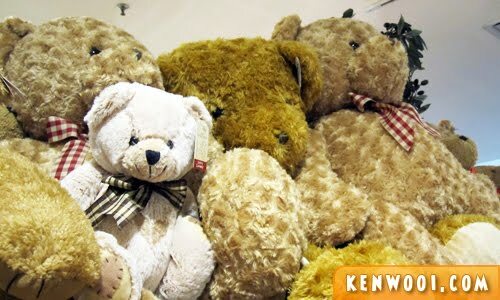 Loves and more bears. His girlfriend/partner can get him that. MOARRRR cuddly waddly fluffy soft toys. Gigantic ones! Am I out of my mind?! Alright, that’s enough of examples. 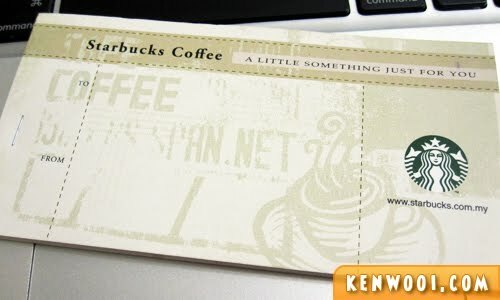 Yes, Starbucks Coffee gift certificate. WIN! Definitely way, way better than getting some Christmas decoration or soft toys for him right? After all, he can at least enjoy a good cup of coffee. So my department had our Christmas lunch recently. The buffet spread was great, and all the presents are set. A lady colleague of ours temporarily turned into a Santarina and gave out the presents. 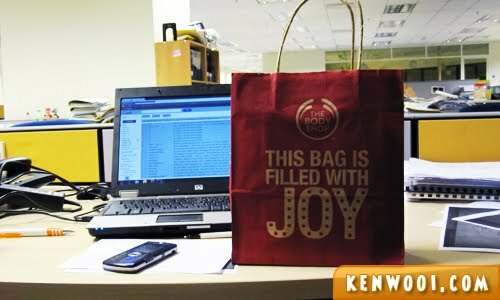 It’s from Body Shop, and the bag is filled with Joy. Simple and nice. A plastic flower, my Secret Santa probably plucked it from some tree decoration in the shopping mall. A shower gel. For this, I guess my Secret Santa must think I’m stinky. That’s why he/she got me this shower gel right? 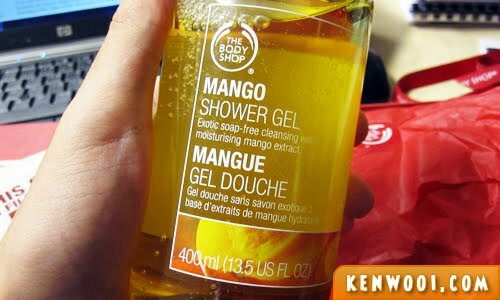 But interestingly enough, it’s also called as Gel Douche in whatever language (German, French?) it is. That’s quite offensive huh? Douche! Anyway, Christmas wouldn’t be complete without a Christmas tree. The shopping malls have humongous ones, restaurants have moderate ones and we have the smallest ones in our home. Since every one is getting one, I decided to get one too. Yes, those are my Christmas tree’s main decoration! Heh! Anyway, most of you wouldn’t be reading this on time anyway. You’ll probably be shopping, count-downing and clubbing – typical Malaysian culture mah! Ken loves the Barbie tree alot eh? 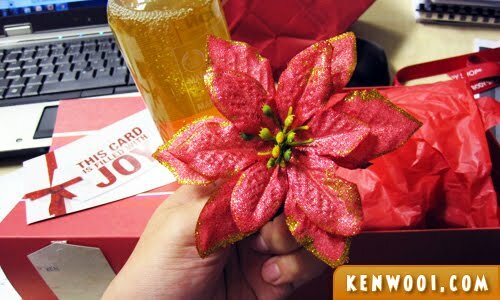 Well, giving away a Starbucks coffee gift certificate and getting a bottle of shower gel in return sounds not bad :) Merry Christmas, Ken and enjoy blogging! merry christmas! You seriously own all those barbie dolls?? HAHA!!! I think the lamp decoration is good what!! Anyway, I thought your tree will filled with bra! HAHAHA!! Wah! A Barbie christmas tree,that’s really special one of a kind,Merry Christmas. Gift vouchers always do the job! those barbies aren’t yours RIGHT? 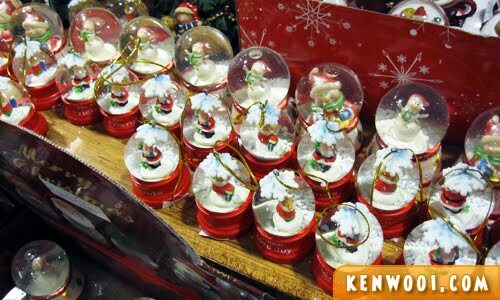 Merry Christmas to you and your family Ken. Voucher could be a good present ! I was thinking where did you took the photo of the christmas tree with barbie on it? The barbie’s store in Mid Valley is it? 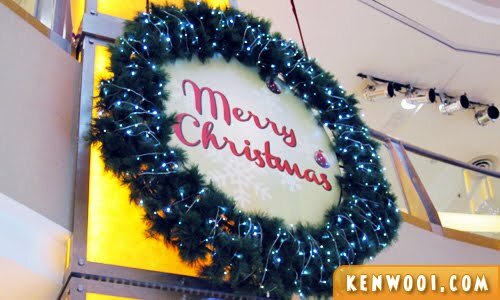 Hahaha..
Merry Christmas to you, kenwooi! 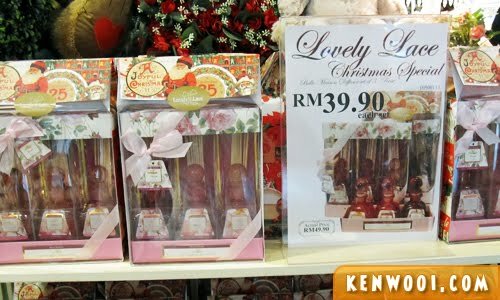 aiyo…a tree full of Barbie ah? can handle ka? 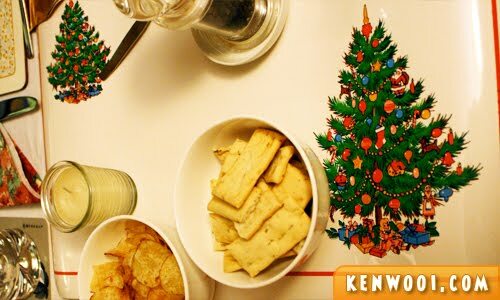 That Christmas tree is really….. -_-” …..creative. How you got so many barbie dolls with you?? Haha quite true that its always hard to buy gifts for guys! Btw, I love that Barbie Xmas tree!! So creative! 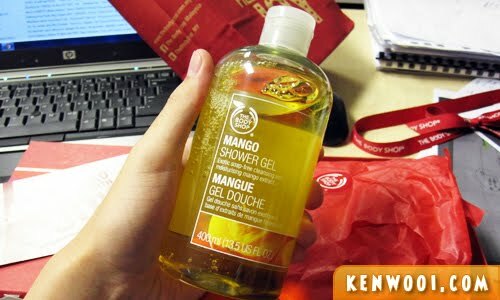 guess ur secret santa headache on what to get you as well that’s why give u shower gel la~ cox everyone need shower! and probably he/she think that you are summer type of guy, that’s why give you mango flavor.. haha.. I was a Secret Santa for a guy at work too.. After hours looking for the perfect guy present, I brought him a toy car… I don’t know if he liked it, but the rest of the team loved it, and anyway… He has a little boy at home …so I hope my present did find a way to be…appreciated. Merry Christmas! 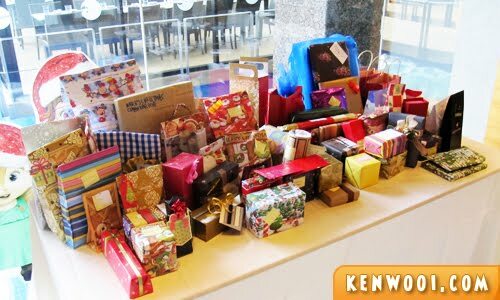 we got some ‘tech-nie’ stuff for guys la… thumb drive, digital photo frame, got geh.. don’t la think that gifts only for girl.. LOL!